For the second year, we held a kite making workshop aimed at the beginner. I called it Kitemaking 101. The new kite makers make simple diamond kites with ripstop nylon and added an appliqued design to the kite. We had 6 people making kites, of that, 3 of them made their first kite and one made their second kite. Some of the participants were fairly new to sewing so this was a nice easy design to work with. They started with pre-cut pieces, hemmed the kite, added spar pockets and then used another color or two for their applique. To finish, they made tails out of scrap nylon. We had a great venue for the workshop. Leo A reserved the Clubhouse, a multi purpose room at the River View Apartment complex in South Portland, thank you Leo. 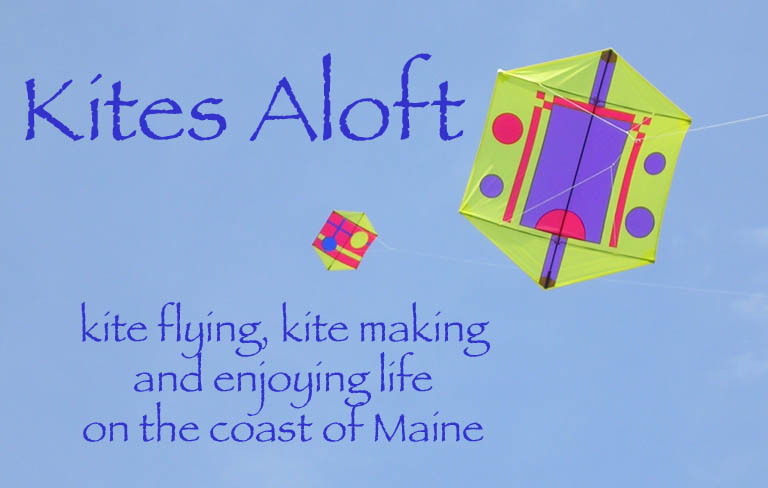 This was the Noreaster's second kite making workshop this winter, Tony O hosted a box kite workshop in January, so we should be scheduling a kite fly for all the workshop participants this Spring. Hi! I am a high school math teacher at Brunswick High School, and I wanted to do a unit on kite building with my students. I have never built a kite before and would like some advice or direction. I have chosen to build kites for what we call "intensives" at our school, which is a strong focus on a specific activity for four days, three hours a day. If there is anything you may be able to do to assist me in this venture, I'd really appreciate it!